As you will know if you read the blogs there’s been a lot going on at Rathfinny. 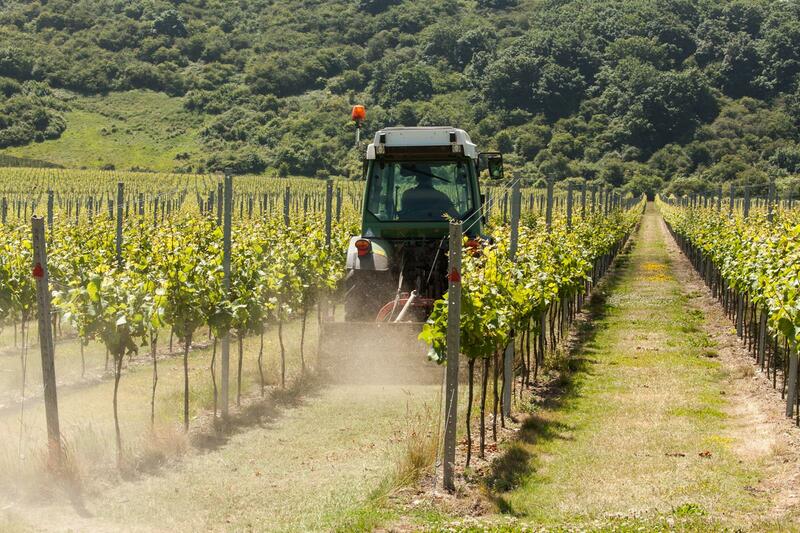 Lucky to have escaped the frost, work goes on as always tending the vines and the Vineyard is looking gorgeous. We’ve started our season of Pop Up Dinners with exceptional chefs, with the option of a carefully matched wine flight. I went to the first one and it was a truly lovely evening where I met new people who shared our long table in the Tasting Room overlooking the vines. 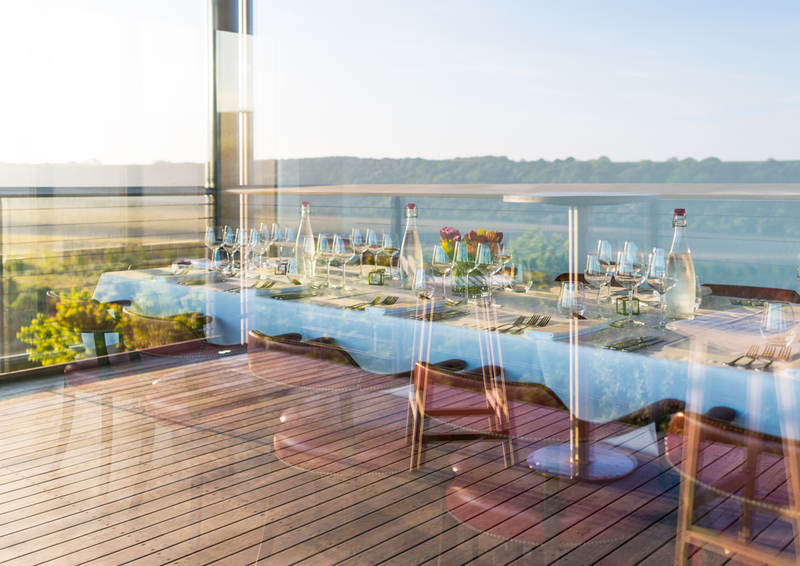 Sunday lunches and now Flint Barn dinners continue to be on offer and the number of guests staying at the Flint Barns, both new and returnees, continues to rise. Millie and I are getting new pet dogs so watch out for the photos. Mark has been away sailing across the Pacific, his life time ambition, which has left me in charge. I’ve made the most of it but am looking forward to him coming home. Once again, we are on the verge of summer with the Vineyard looking great. After a very early and very warm beginning to the spring the vines shot forward a good two weeks in their growing season. However this was short lived with a nasty cold period in late April slowing everything up and bringing frosts. Due to our proximity to the sea, we managed to mostly avoid damage although many vineyards both here and on mainland Europe have been plagued with frost damage this spring. Since then though the sun has been out and the vines are thriving, interspersed with the odd drop of rain has certainly helped our cause, we have just finished all our shoot thinning and part way through our first tuck. We’re looking ahead to flowering towards the end of next month, by that stage we’ll have a better understanding of just how much crop we’ll end up with this year, so far (without wanting to jinx things) it’s looking great. It is always exciting to release new wines and the 2016 Cradle Valley is no exception. We enjoyed a long growing season, which started rather cool but ended with a sunny and warm September and October. We were thrilled to harvest beautiful Pinot Blanc and Pinot Gris with great acidity and flavours. Even the sugar level was perfect! We decided to have the wine go through only a partial malolactic fermentation in order to keep most of the crisp acidity which feels perfectly balanced now with the roundness of the wine. The blend is exactly 50% Pinot Blanc and 50% Pinot Gris and expresses wonderful floral and fruit notes. We will officially be releasing the wine during Alfest, on July 8th 2017 on the Tye in Alfriston. We hope you find the time to come to this fun day and while you’re there, please come visit us and taste this wine! It always amazes my friends that I have been part of the wider Rathfinny ‘family’ for over four years and I still have not brought them a bottle of Sussex Sparkling. My generation is used to everything being on demand so “Not ready yet” and “still waiting for the wine to develop” does not seem to register with them as a satisfactory reply. I’m not sure they really understand the time and effort it takes to produce these fabulous drinks. So, I thought I would take time out from watching our 2014 Blancs de Blanc ageing to give you an update on our current building project. 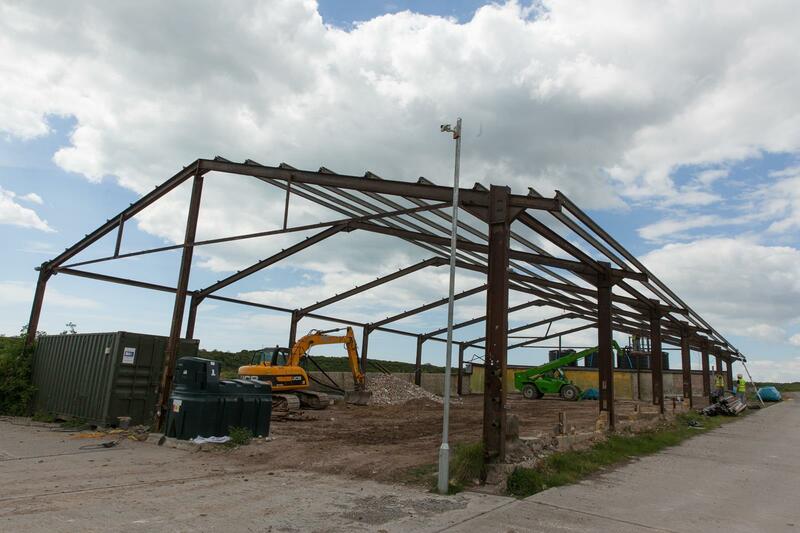 We have been very excited to announce that we have started to work on our two new production buildings. Unglamorously they have so far been called phase 2 & 3 (after the winery was imaginatively called phase 1) but I’ve taken to calling them the Riddling Barn and the Cellar. 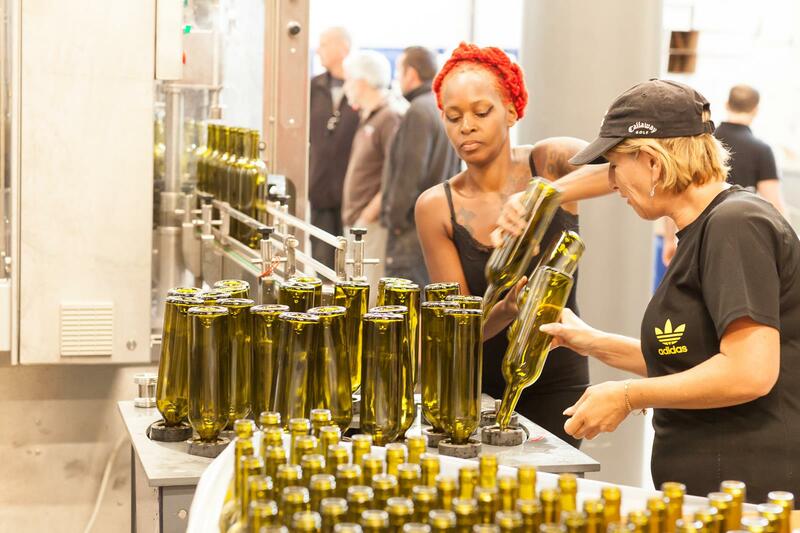 The Riddling Barn will house a bottling, labelling and disgorging line as well as a riddling area for all our wines. This will be an extremely active building that will use the latest technology from Champagne to ensure consistent quality and faultless wines. The Cellar, where our wines are aged on-lees for at least three years, is by contrast a building that is all about being slow and taking our time. A key part of creating a quality sparkling wine is to take a step back and give the wine space and time to age and develop. As the wine is doing all the work in the Cellar, the building’s core task is temperature control. The building needs to keep a very precise temperature without fluctuation throughout the building regardless of the outside conditions. These are both key buildings for our wine production and the final pieces of the jigsaw that we need to produce top quality sparkling wine. Since being granted planning permission for the buildings in April 2016, we have taken a year out to review the Riddling Barn’s layout, using expert advice from our friends in Champagne, to ensure we have a set up that is smooth and efficient for Jonathan and his team. Like our Sparkling Wine, we have taken the time to work slowly and carefully on the design to ensure we get it right. However, we are rapidly running out of space in our winery and we will not have any more space after this year’s harvest which makes it important that we complete the new buildings before the October 2018 harvest. With this in mind, we went through a competitive tender process and were pleased to appoint Scorpion as our main contractor. Scorpion has made a great start to the project removing the old cattle shed on site and has been preparing the ground works for the buildings. The steel has arrived on site in the last week and the steel frame will start to be erected next week. The project is currently on schedule with a completion date of January 2018 for both buildings before we start fitting out all the winery equipment. Not only are these buildings important for us to achieve our goal of being a top end Sparkling Wine producer but it is also great news for the local area. Rathfinny was once an arable farm employing one farmer but we have now become a significant local employer. The Riddling Barn and the Cellar will result in us doubling our workforce. I am very proud that we are creating a significant number of rural-based high-skilled jobs in this rapidly growing industry that is creating an in-demand high quality world beating exportable product. Whatever side of the line you went with Brexit (and typical of all families, our wider Rathfinny ‘family’ had views covering every base and some) the English wine industry is just the kind of medicine the Brexit doctor ordered. At Rathfinny we have an ambition to make ourselves renowned for unforgettable dining experiences as well as exceptional wine. This has certainly been at the forefront of my job since I joined Rathfinny a year ago. It may be because of my love for food that this seems to have become a prominent mantra on the Estate. I believe that it is important to achieve this ambition for three reasons. Firstly, it goes without saying that food and wine go hand in hand. Secondly, we aim to be at the forefront of food and wine pairing in the English wine industry, an element to our business that we are constantly building. Lastly, we want to make sure that we are creating a complete customer experience surrounding our wines. As some of you may already know, we have held two very successful Pop Up Restaurants in our Tasting Room overlooking the vines. The first of which was with private chef Chris Bailey, who has worked for some of the top restaurants in London and Spain, culminating in being awarded a Michelin star at The Black Rat in Winchester. He is now focussing on catering for private and corporate events including pop up dinners and his weekend at Rathfinny was a truly memorable one. The second successful pop up was with chef duo Smoke and Salt who are two aspiring chefs keen to make their mark on the modern dining scene. Their passion for cooking and creating dining experiences truly shone through on what was also a memorable weekend in the Tasting Room. Don’t worry, if you missed either one of these unforgettable Pop Ups, we have more lined up, including Martin Carabott in July (sold out) and Ruth Hansom in August. We still have some hot tickets available for Ruth’s Friday night event. Please check out our website for more details. I am also excited to announce that we are about to put on sale a November Seafood Pop Up with the Billingsgate Market Seafood School and chef Sean Wood. Sean cooks unique and distinctively flavoured dishes with seasonal ingredients and meticulous attential to detail. 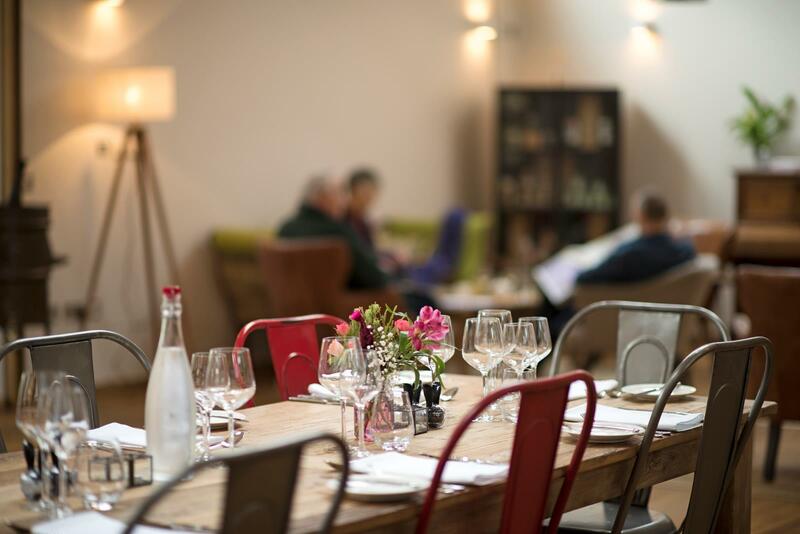 This event will run in a similar format to our summer series of pop ups (five course tasting menu with each course matched to English wines, where possible) but will be focussed entirely on seasonal seafood, caught in Hastings, East Sussex. 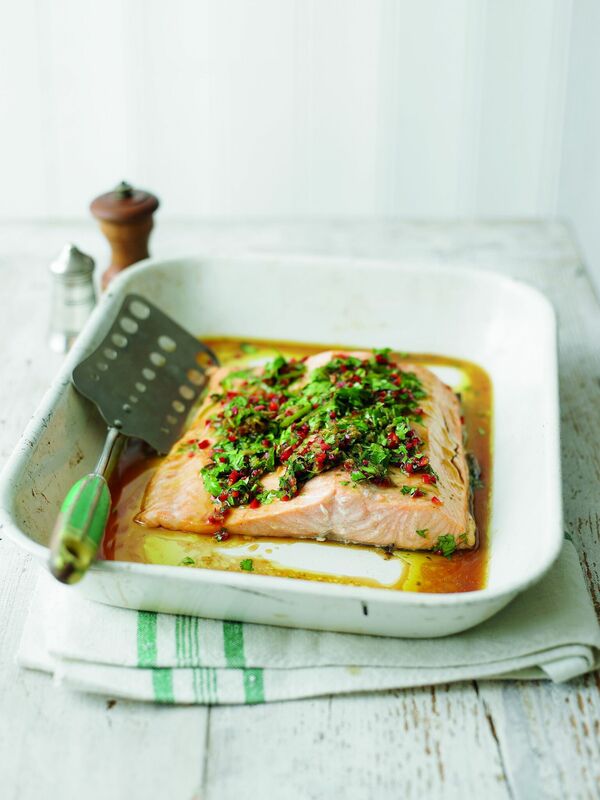 The market itself began in 1327 in London and is no doubt, the centre of seafood for the country being the UK’s largest inland fish market. We are extremely honoured to be working with Billingsgate to produce a weekend of dining experiences revolved around the freshest seafood caught locally paired with our still wine, Cradle Valley and other English wines. Where possible we aim to source our food locally and what better way to showcase this than two evenings of sensational seafood brought to you from the best source! Watch this space for tickets, they will be popular so make sure you book them quickly to avoid disappointment. 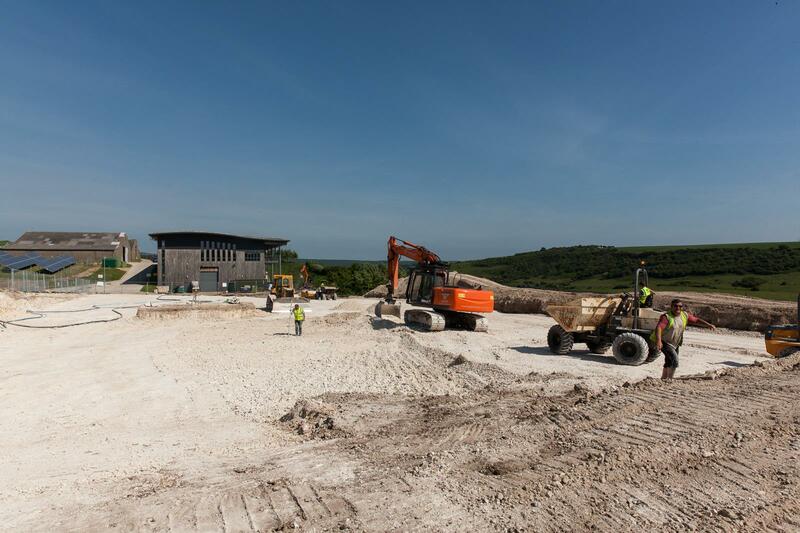 Please email events@rathfinnyestate.com to register your interest. Alongside our pop ups we are also sponsoring and organising the second year of Alfest, a food, drink and music festival on the Tye, Alfriston on the 8th July 2017. Working in conjunction with us is The Star Inn, Alfriston and Long Man Brewery from Litlington, and together we are looking forward to bringing you a relaxed day with fabulous foods, wonderful wines and awesome ales! The festival is free entry so do come along with your friends and family and don’t forget to drop by the Rathfinny stall. We will be launching our 2016 Cradle Valley as well as serving ‘Sisters and Tonic’ made from our own Seven Sisters gin. Keep an eye on the Alfest twitter page @AlfestMusic for more information and updates. We have seen a steady increase in businesses approaching us looking for an unusual venue for a residential or day meeting. They’ve told us they don’t want to go to an impersonal, run of the mill hotel. If there is spare budget for an away day they want something different. We certainly have ‘different’ to offer. Our venues are right in the middle of the Vineyard and South Downs National Park with unparalleled views, facilities, food and service. The Flint Barns not only offer 10 en-suite bedrooms but additional spaces to use for breakout sessions and down time. The lounge, snug, dining room and courtyard are available to use throughout the exclusive use booking making the Flint Barns the perfect meeting place to make the most of your time out of the office. We work with local businesses if you want to enhance your stay, whether it is a physical activity such as archery, cycling, yoga or paddle boarding (or even combining the last two!!) Utilising the dark skies on the Estate and our local astronomer makes an inspirational and fascinating end to a busy day. Throughout your stay at the Flint Barns with your group our team will be ready to help with your schedule. You can stay on a full board basis or just visit us for the day. Equally, the Tasting Room and Winery can be hired for corporate activity. From presentations to clients incorporating a talk from one of our team, a tour of the Winery and a guided wine tasting to a strategy meeting for a smaller group. However, the view from the Tasting Room can be a little distracting! Both the Flint Barns and the Tasting Room can be used as a venue for a team or client summer or Christmas party. We have a wide variety of menus or options for catering. A summer’s evening of canápes and drinks on the balcony overlooking the Vineyard or a BBQ in the courtyard to winter’s night in front of the fire playing after dinner games. Wow!! It’s a blustery & wet day outside today as I write this little piece for our Summer Newsletter. A lot has been happening down at the Flint Barns. Our Sunday Lunches have been going down a storm with people, with most of them booking out within a couple of hours. We use as many local producers as possible and prepare a lovely lunch with two-courses costing only £21.00 and a three-course only £27.00. A great place to come and just have a lunch or celebrate something with your friends and family. New dates for August & September are due to be released soon so make sure you are signed up for our email. We’re hoping to be able to open up the courtyard soon and have a summertime BBQ with live music. As always, the weather plays a big part with outdoor events so fingers crossed for a great summer where we can sip a chilled glass of Cradle Valley in the Flint Barns courtyard. To receive info about events at the Flint Barns and regular updates, please sign up to our mailing list below. Spike & I have been making good use of these lovely warm mornings and evenings on the Rathfinny Trails. 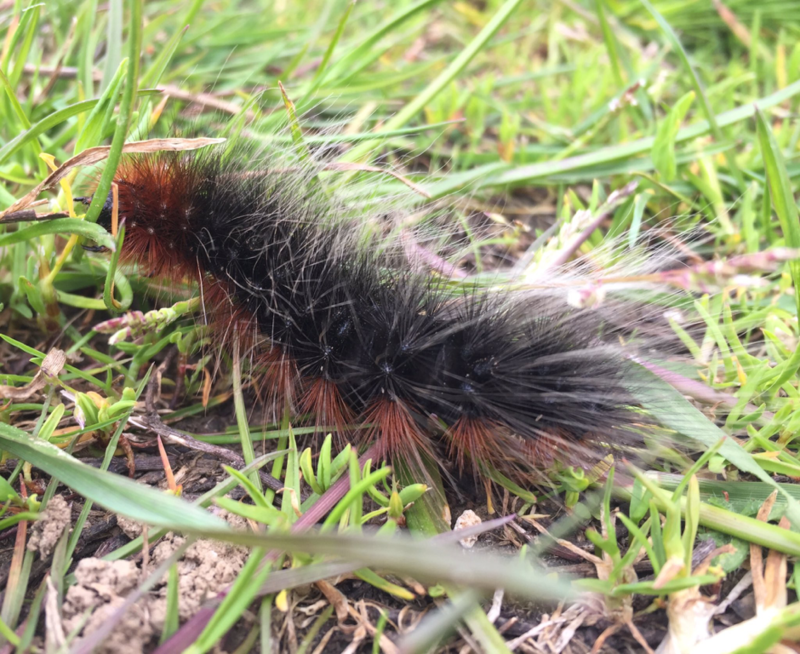 There really is so much to see when you are out there walking around – we even spotted a very hairy Garden Tiger caterpillar munching on the lush grass. You can find a link to the map of the trail below. The Gun Room continues to go from strength to strength. Not only has our footfall increased remarkably since we opened in November 2014, but we are now receiving a great deal of positive feedback. It seems our visitors enjoy the special ambience here – the peace of the Tye, the beauty of our award winning building, and the warm welcome provided by our staff. We are really blessed to have a brilliant team here in the Gun Room; we are an eclectic bunch, but we all enjoy dealing with customers, sharing our knowledge of English wine and enthusing about Rathfinny Wine Estate. Perhaps this is why we have recently been awarded a Gold Medal in the IWC (International Wine Challenge) Cellar Door Award 2017. What an honour and a testament to the hard work of the entire team. We are pleased to promote the work of our friend Dr June Goodfield, whose book ‘The South Downs Alphabet’ was published recently by Lewes based Snake River Press. June and fellow Write House founder, Peter Robinson, working in collaboration with the South Downs National Park Authority, masterminded a wonderful project over the past two years. In 1924 Eleanor Farjeon, poet and lyricist of ‘Morning Has Broken’, wrote ‘A Sussex Alphabet’, a series of poems that were published as a book in 1939. These poems reflect her love of this special landscape, and include themes which are relevant today. The project used her book as a starting point to inspire others to create their own poems around similar themes. School children and members of the U3A took part in a series of walks and workshops, resulting in the composition of original poems which are presented in the book ‘A South Downs Alphabet’. Radio 4 presenter, Clare Balding, got to hear of the project, and invited June and others to take part in her BBC Radio 4 programme, ‘Ramblings’. The group walked part of the South Downs Way and stopped off at the Flint Barns, before making their way into the village and eventually to the Star Inn which Eleanor featured in her classic poem, ‘All the Way to Alfriston’. We have just received our copies of both books, so please do come in and have a look – we’ve placed them in the Heritage Centre. Whilst we await the arrival of our sparkling wine next year, we continue to offer free tastings of our still wine ‘Hobbs Hawth’. Our ‘Seven Sisters’ gin is proving to be extremely popular as well. Why not drop in for a visit? We would love to meet you! 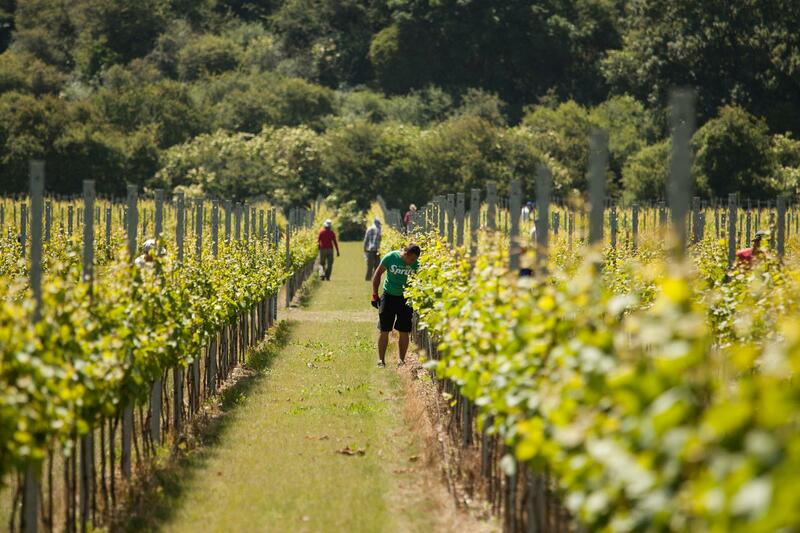 The whole process of making high quality sparkling wine and managing a working Estate keeps us all busy and it was always our intention to ensure Rathfinny is part of the local community and part of Sussex. Over the years, we have received many requests for presentations and talks to a myriad of groups and charities from Probus, Chamber of Commerce and Breakfast Clubs to accountants and lawyers and to national groups such as the WI, National Trust, National Park and National Farmers Union. These presentations have also been varied covering topics from the history of Rathfinny, the wildlife, the vineyard management, making wine, wine tasting to transport and logistics. 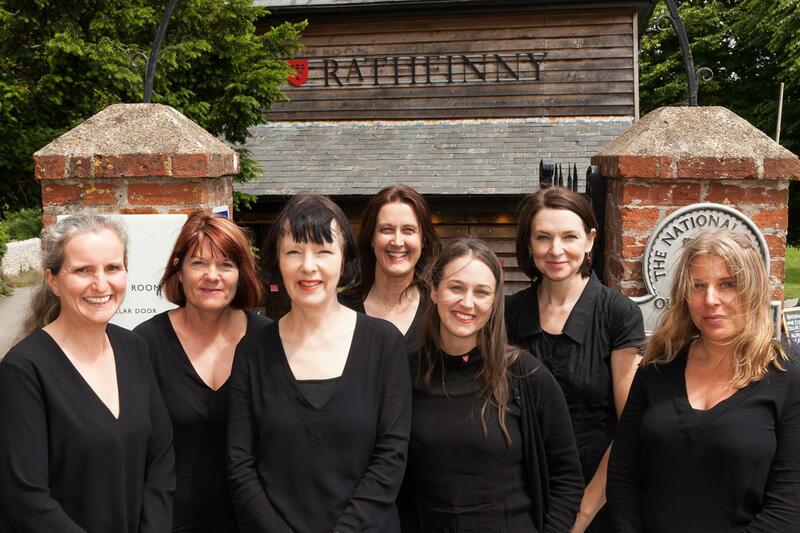 Rathfinny is also keen to enhance education, in its broadest sense where we can. We offer 2-3 work experience weeks for local schools which can be either on the Vineyard, Winery or our Cellar Door or a combination of all three. 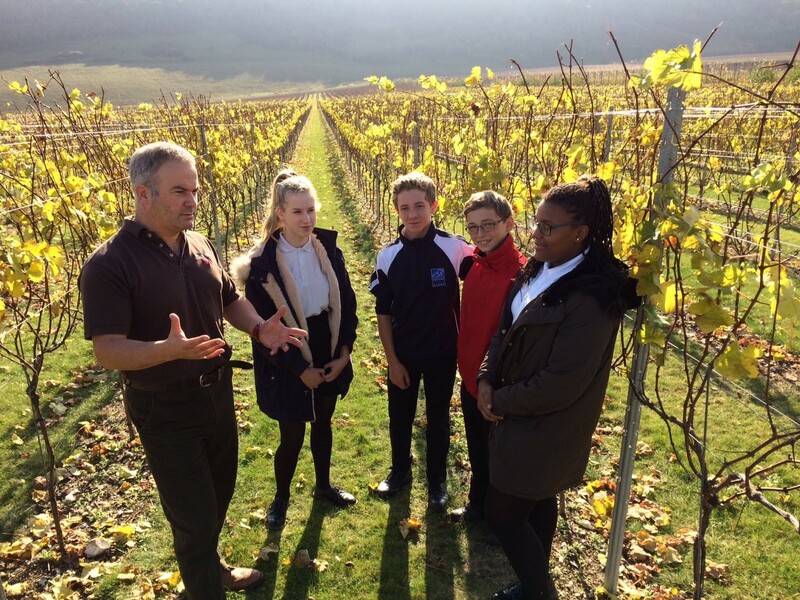 We are also part of East Sussex County Councils Open Door initiative which is a great way for a larger group of students to a gain insight into how we work and what opportunities there are open to them in the future. We are fortunate here because even though our main focus is on the agricultural process of growing grapes, the rest of the business involves wine making, chemistry, planning, food hygiene, project management, hospitality, sales, marketing, accountancy, IT, cookery, geology, agronomy, so we must have something for most students. Personally, I am also an Enterprise Advisor for East Sussex County Councils schools. As well as offering help to any school in East Sussex I have been assigned one particular school to assist which is Peacehaven Community School. This can range from meeting with Governors or senior leadership teams to offering specific targeted advice to the students. This includes interview techniques, CV compilation, presentation skills or just a talk about careers in general. The Enterprise Advisor network also allows us to call upon other advisors who may have a specific skill set which a particular school requires. We also have regular CPD meetings to ensure we are kept up to date on education and we also have the opportunity to assist ESCC with their training for the teachers to provide them with up to date information on the workplace. We also have a new fledgling partnership with Team Domenica based in Brighton who assist adults with learning disabilities to find and retain employment in the local community. We are opening our doors to them with an aim to attract someone to work with us on a regular basis. If you wish to gain a small insight into their work and what they can do I would strongly recommend a visit to their café near the Pavilion in Brighton it's a great place for a coffee and cake. I should also add that all the proceeds from the presentations that I have done, from 1.5hr technical presentations to after dinner talks have been donated to the Trevor Mann Baby Unit in Brighton Hospital. An incredible unit that cares for the youngest of the young in their hour of need. The care shown to my triplets, 3 ½ years ago was outstanding. Anyway, back to the sparkling wine production….